For all the UK based poker players among you the brand William Hill has become a household name for sports bets, bingo, casino and so much more over the past. Being one of the oldest and largest bookmakers (established in 1934) William Hill decided to start their online poker service in 2004. 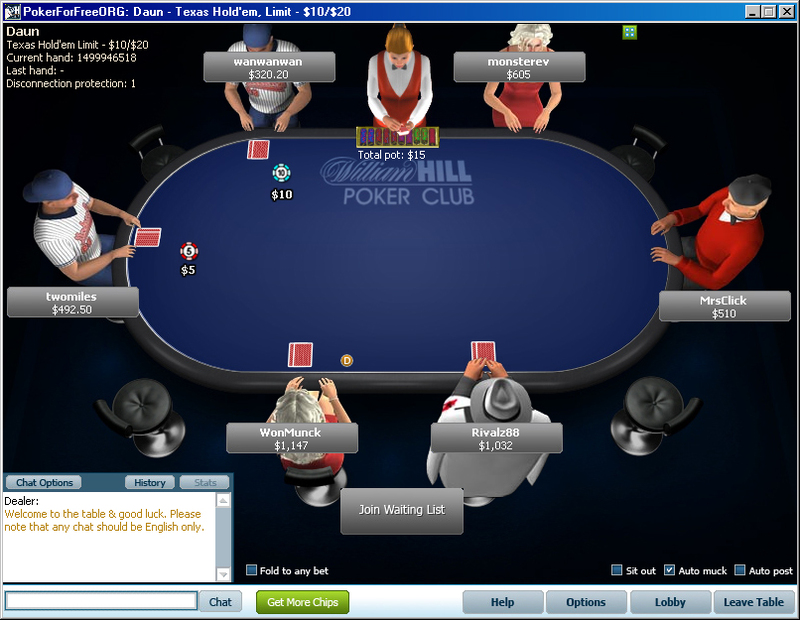 The William Hill poker room however was held back due to being part of the somewhat controversial Crypto network that is arguably not the best of platforms for online poker. 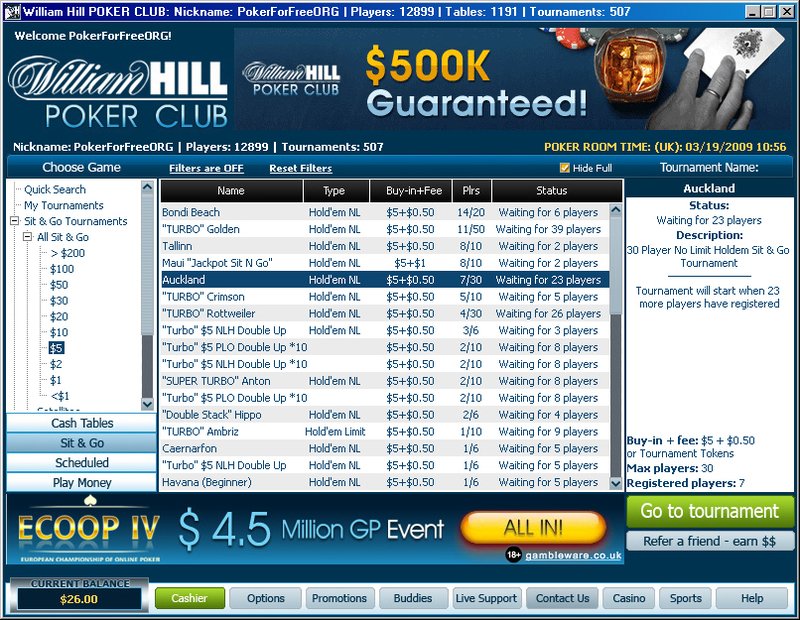 Fortunately William Hill Poker has recently switched networks and is now being hosted on iPoker which has been heralded and welcomed as a big step towards establishing their poker branch. The reliable iPoker network has a great reputation and just as importantly already a huge base of poker players which ensures that you will be able to find lots of good games around the clock at William Hill Poker. The poker bonus offered by William Hill gives you ample opportunities when it comes to squeezing out the extra dollar. While their proclaimed standard currency on the tables is $ (and by standard they mean exclusive) they offer their poker bonus in Pound Sterling, Euros and Dollars in order to let you choose your preferred currency for your first deposit. While this may seem cosmetic and somewhat strange it actually can help you get a higher bonus if you choose to use the strongest currency at that particular time, so always keep an eye on the current exchange rate. The poker bonus offers are 100% up to £400, €450 or $600 respectively and the bonus will be cleared in increments of $10. William Hill doesn't only have one of the best poker bonus offers that you will find in online poker. You will also be able to take advantage of various promotions such as the Bad Beat Bonus and Best Hand of the Day Bonus and they also offer a very good loyalty programme. You will be able to advance in VIP levels when you gather William Hill Points (WHPs) and when doing so you will receive the so-called VIP booster. As the name suggests this will let you earn more points at higher levels. You can use your WHPs in order to clear your poker bonus or for various other opportunities such as cashing the points in for an instant bonus payment to your poker account. One of the first things you will notice after registering at William Hill and installing their software (which is only available for MS Windows, there are no flash nor Mac version at the moment) is the personal real time support in the separate live chat window. You will be greeted instantly and any special deals that are currently on offer will be brought to your attention. You are also able to ask for details on whatever is of interest to you and will be assisted instantly. While a lot of responses (especially regarding the special offers) will be automated and pre-typed messages that are copied and pasted you will nonetheless receive responses to your specific questions from real people. The automated responses simply help speed up the process. On our test the response time in the life chat was very good indeed. We also contacted the very friendly support at a later time and while we had to wait for approximately 2 minutes for a response then we were assisted very expertly and quickly after that. The short wait simply was the live chat equivalent of letting the phone ring. All in all it is probably one of the most efficient and professional support services in the online poker industry. The software itself offers clean design and will let you navigate very quickly. Finding your preferred game is very easy and we have not experienced any connection problems or slowdowns whatsoever. The fact that William Hill Poker did offer a flash version with their old software at the Crypto network gives reason for hope that they will also come up with a flash client for the new poker software at a later time.